Last year, there was a story about a child born who naturally suppresses myostatin. I for one welcome our new bovine overlords. @Horselover: nice name and pic. Heard from any pink God-lasers lately? Also, the supercow thing strikes me as potentially highly unethical. Wouldn't all that muscle be painfully sensitive? Athletes needs muscles that are strong, not big. 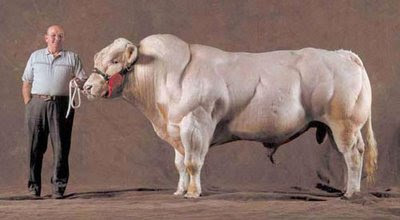 With cattle this size we can surely power our cars with Methane from their waste! Cattle feed-lots will soon be the "New" fuel wells! Yes it is a cow, and the bred has been around for a long time. Unfortunately the gene maked them prone to other disorders, and makes giving birth naturally for these cattle nearly impossible as the extra muscle makes an extra big calf and an extra narrow birth canal. I want to know what it taste's like before I call it "super".